Search for the best flight prices from Stansted to Aalborg. Compare prices, book today and save money with Stansted Airport. Denmark’s fourth largest city has recently been rejuvenated, transformed from a largely industrial area to an interesting and appealing place to spend a long weekend. Sitting on a wide fjord on Jutland, the waterfront has become the focal point of Aalborg, with the impressive Vester Fjordpark a great place to enjoy an outdoor swim while overlooking the green hills of Nørresundby. Meanwhile, music lovers will enjoy Musikkens Hus, a futuristic gem which has become the city’s new musical hub. If the Musikkens Hus whets your appetite for impressive architecture, enjoy a drink at the Utzon Center, a group of silver boat-shaped pavilions created by Sydney Opera House designer, Jorn Utzon. Of course, Aalborg also has natural beauty in abundance. Kildeparken is one of the city’s oldest parks, and here you’ll find fountains, the work of famous sculptors, and the Singing Trees – since 1987, more than 80 renowned artists have planted a tree here, including Elton John and Stevie Wonder. 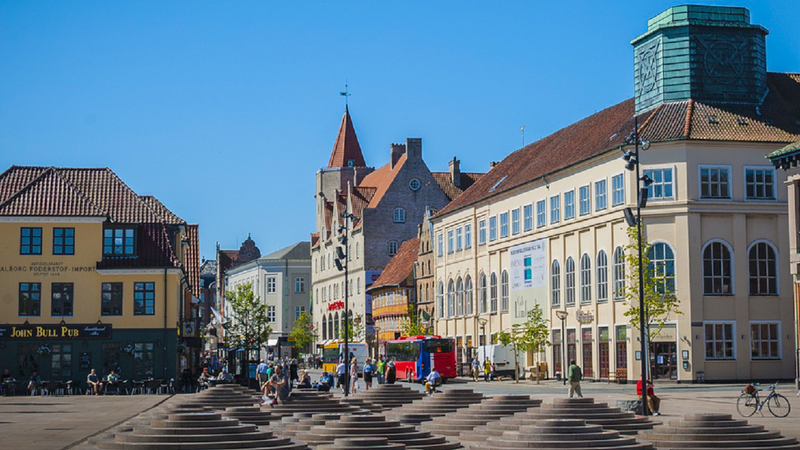 If you're after location, you can't get closer to the city centre than Aalborg Apartments, just 100 metres from Budolfi Cathedral and a three-minute walk from Aalborg Historical Museum. Scandic is also well-located, only 400 metres from Aalborg Station and a ten-minute walk from the popular Kunsten Art Museum. For old-fashioned charm, the four-star Helnan Phønix is located in a stylish 18th-century building, across the road from famous shopping area Algade street. The main shopping streets in Aalborg are Bispensgade and Algade, with a few smaller streets attached. Here you'll find everything to satisfy a need for retail therapy, from shopping centres (Aalborg Storcenter, Friis and Shoppen, to name a few) to independent boutiques and quirky shops. Danish designers such as Holmegård Glass, Stelton, Royal Copenhagen and Georg Jensen can be found in many interior shops and department stores, and you can also visit the workshops of one of the city’s renowned glass artists, Lene Højlund, and discover how her unique items are made. Aalborg is famous for schnaps, and you can buy a bottle of Aalborg Akvavit in any supermarket in the city, whilst at the wine merchants, you can find an entire range of different flavours! The foodie scene in Aalborg is growing, with plenty of options to choose from. Local favourite Bistro V has outdoor seating and vistas looking out on the water, so you can enjoy your meal with a view. Try their 'The King' burger, which includes a sauce that takes three days to make. Afterwards, take a trip to Vesterå for delicious cocktails and a generous Happy Hour. If you need to refuel whilst sightseeing, head to Landmad, a cosy cafe serving homemade food made with locally sourced ingredients. The largest carnival in Scandinavia and one of the biggest in northern Europe, Aalborg Carnival is a spectacular event stretching across the last weekend of May. Between the fun and energetic children’s carnival, the hard-fought battle of carnival bands and the incredible carnival proper there’s sure to be plenty for every visitor to enjoy. While not an annual event in the city the Tall Ship Race, previously the Cutty Sark Tall Ship Race, often uses Aalborg as a port – consuming the city in a fit of maritime fever. If you have the unique opportunity to visit Aalborg while it’s playing host, make sure you don’t pass it up.